I still don't like Pominville. The Sabres have a better PK than the Bruins. 3rd best, even. Krejci has gotten a point in each of the Bruins wins on the current streak. Matinee game means morning post means not the most in-depth ever. In each previous game, the home team has won. 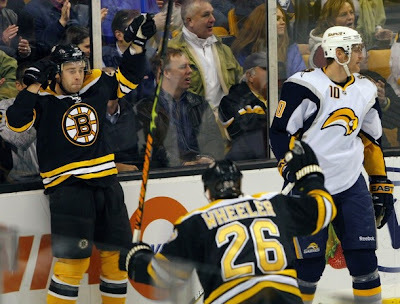 Game 6: Bruins 2 BUF 2 SO LOSS in Buffalo. Ryan Miller stole that game. Game 14: Bruins 3 BUF 1 Win at home. As Jack Edwards said, "Chucky's Back!" Game 19: Bruins 7 BUF 4 Win at home. This game was insane, with it being 3-4 at the end of the third. Manny then doesn't let anything in for the rest of the game. Game 22: Bruins 2 BUF 3 Loss in Buffalo. The game-winner is a SHG. Derek Roy shot one off of Krejci's stick into the net. The Bear Cave: "Marc Savard is the leading scorer in the season series, as he has two goals and four assists for Boston." NESN First Shift: "Tim Thomas (16-3-3, 2.04) or Manny Fernandez (13-2-1, 2.02) vs. Ryan Miller (16-10-4, 2.58)"